The Library Link of the Day features this article about the new Abraham Lincoln Presidential Library and Museum in Springfield, Illinois. The facility is garnering a lot of attention over its interactive exhibits, which use a new technology called "Holavision" to display ghostly images that interact with live actors. A library representative said Holavision is a patented, secret process that allows for the formation of images in the air where there is no image-forming screen or surface. 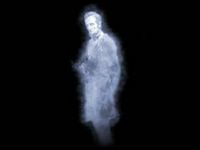 The Holavision exhibit "Ghosts of the Library" puts Lincoln right in the room.